There was to be no knockout blow in the 2018 Auckland SuperSprint as the Championship contenders shared the honours, but who was left on the ropes? Who would have predicted after 400km of racing that the Championship order and points would remain the same going in to the final round? Well, that’s exactly what happened at New Zealand’s Pukekohe Park as the Supercars championship made its only trip overseas for the year. A large crowd got to witness the Kiwi vs Kiwi battle at the front of the order, not only on track but in the championship standings, as the points difference remained the same over the round, setting up a gripping final round in Newcastle. Though it’s easy to pick those that were the top performers over the weekend, the attention on those at the front meant a majority of the pack hardly got screen time, thankfully masking the issues for some. Scott McLaughlin came into his home race leading the championship for the first time, enjoying a slim 14 point margin to Shane van Gisbergen in the all-Kiwi race for this year’s title. Pole position for Saturday’s race boosted his confidence going in to the afternoon’s action, though his title rival lined up alongside the DJR Team Penske driver, making for a tight scrap in the opening laps. 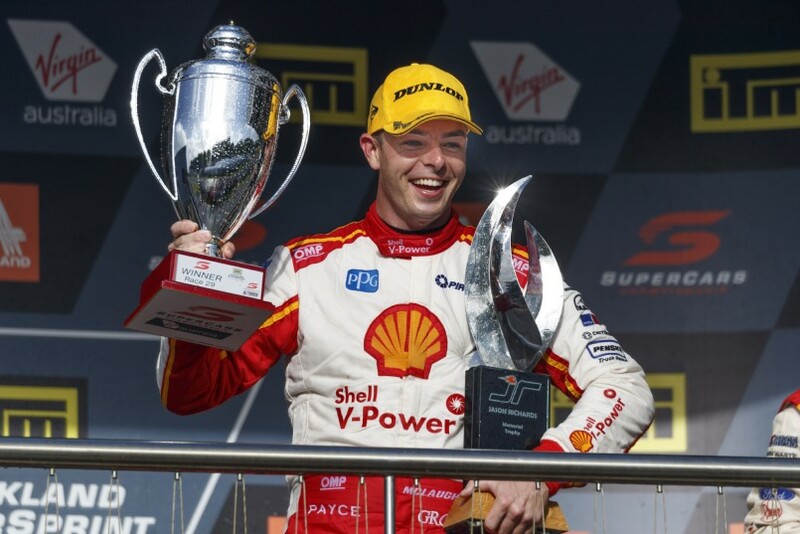 McLaughlin was left vulnerable in the dying laps on older tyres, copping a serve from van Gisbergen who went on to take the win despite a five second penalty. The championship leader would get his own back on Sunday, putting in another calculated drive to take the win, despite a high pressure attack towards the end of the race by Jamie Whincup. Finishing on equal points to van Gisbergen over the weekend, McLaughlin took home the Jason Richards Memorial Trophy thanks to his pole position on Saturday, his first win of the accolade. Now going in to the last round in Newcastle with the points lead, McLaughlin is in good stead to win his maiden championship but must keep his nose clean unlike last year if he wants to get the job done. Shane van Gisbergen may have been tied for the round win in Pukekohe but despite this, it was a weekend of luck for the 2016 champion who had his fair share of incidents which could’ve put him further back in the pecking order. Lining up alongside McLaughlin, he had to play second fiddle in the opening stint but had better car pace. A mistake in van Gisbergen’s pit stop saw him spin the wheels as the car was dropped, causing a day-long battle between Triple Eight, Supercars and DJR Team Penske as he wasn’t penalised. Charging up to the back of McLaughlin with 10 laps to go, a bump and run to make the pass for the lead earned him a five second penalty but on fresher tyres, he was able to come home 5.5 seconds ahead of McLaughlin. On Sunday, it didn’t look like the #97 was as quick as the day before as the team made a setup tweak but forgot to remove one of the incompressible jacks under the car, costing time. Again on fresher tyres, van Gisbergen made his way up the field and was handed second place by Whincup to help his championship tilt, something which wasn’t received well by the fans. With experience behind him and a team-mate who is fighting at the top as well, van Gisbergen is in a good position for the title despite being down on points to McLaughlin. Jamie Whincup returned to New Zealand knowing he would have to help his team and play as tail gunner to van Gisbergen. The seven-time champion isn’t used to playing second fiddle to a team-mate but Whincup did just that in Auckland, especially on Sunday. Fifth is the best Whincup could muster in qualifying for Saturday’s race and that’s where he finished, despite having to play the team game and double stack behind van Gisbergen under the race’s only safety car, losing a bunch of spots. Pole position ahead of McLaughlin was more to Triple Eight’s taste on Sunday with Whincup leading the race early on but then losing the lead to McLaughlin after the final round of stops. Mounting immense pressure on the Kiwi in the final laps, Whincup couldn’t get past the #17 for the win, backing off on the front straight to let van Gisbergen by for second. After showing everyone that he would do anything to help his team-mate win the championship, Whincup knows what his job is heading into the season finale in Newcastle. Fabian Coulthard and his run of bad luck at Pukekohe continued, again bowing out on Saturday for the second year in a row due to another incident. While McLaughlin took pole for race 28, Coulthard ended the session in a disappointing 19th place, starting well down the order in a spot where he couldn’t hope to make an impact on his team-mate’s race. Qualifying in a spot where he was racing for the mid-pack world championship, Coulthard found himself caught up with Lee Holdsworth and Richie Stanaway who made contact with each other, sending the #12 into the fence at one of the fastest parts on the circuit. An overnight rebuild from DJR Team Penske saw Coulthard return to the track on Sunday, qualifying in a much stronger sixth place. While van Gisbergen had his mistake in the pit stop, Coulthard’s team failed to capitalise on the error by dropping him early to place him in front of the #97 as a long stop saw him emerge just behind the championship contender. Coulthard came home in seventh place, well behind McLaughlin as Triple Eight secured the teams championship with one round to spare due to Coulthard’s hard season 2018. Richie Stanaway entered his home round after suffering a torrid rookie season in Supercars despite being touted as one of the future stars of the category. Unfortunately for the young gun, imprivement is yet to come after two more poor results in New Zealand. Qualifying in a respectable 12th for race one, the aforementioned incident with Coulthard and Holdsworth earned him a drive through penalty, dropping the #56 well down the order as he came home a lowly 23rd. Sunday seemed to be an improvement from the outset, making the top ten shootout and starting in seventh after a loose qualifying lap. Somehow the Tickford driver still managed to struggle in the race, falling way back from his seventh place starting spot to finish in 20th, the lowest of Tickford’s drivers. As rumours start to swirl about what will be in the GP2 race winner’s plans for 2019, a strong result is needed for Stanaway in Newcastle if he wants to remind everyone of the talent he possesses. Todd Hazelwood may take the unenviable title as the wooden spoon driver of the year as he currently sits last on the points table out of the full-time drivers. As last year’s Super2 champion, Hazelwood and the Matt Stone Racing team had high hopes coming into their first full-time year in Supercars but almost every round has been a struggle. The lack of pace didn’t disappear in New Zealand despite Hazelwood improving on his qualifying position in both races. However, this wasn’t something to write home about due to his one-place improvement in race 28 coming thanks to Coulthard’s retirement and Garth Tander having a shocking race, Hazelwood ending up in 24th place. Qualifying in last on Sunday, he was only able to make up a spot in the race with Tim Blanchard finishing in the bottom spot. As Hazelwood and MSR go to Newcastle, they’ll be reflecting on the difference 12 months makes after they secured last year’s Super2 championship at the venue. Back in Australia for the next round, it’s time for the final round of what has been a long year of racing with Newcastle again wrapping up the season for the second year in a row. Last year it was the scene of possibly the most tense final race in a very long time, something which fans of both McLaughlin and van Gisbergen will hope isn’t repeated this year or else some defibrillators may need to be on standby. Action kicks off on 22 November with the Championship being wrapped up on Sunday the 24th, where either way, we will see a Kiwi raise the trophy.